Oregon is a state not known for producing many hockey players that go onto division 1 schools, or the National Hockey League. There have been a few, such as Paul Guastad (Portland Winterhawks and Buffalo Sabers), Ben Stadey (Providence), and Matt Bader (Air Force). The next player that can help provide hope for local youth players is Kyle Singleton. Singleton originally started his youth hockey career in Medford, playing for the Rouge Valley Stars. He played there until he was a PeeWee, eventually moving to Portland because the competition and teams up there were a lot better (he joined my team a quarter into the season). Portland is really the only area that has a youth organization that produces decent players. Bend, OR could compete, but they only have roller out there. Singleton continued to play in Portland for the Jr. Hawks. I had the opportunity to play five years with him up until our second years of midgets. Both of our last years were on the local u18 team. I hung up the skates, but Singleton was well on the rise. Before the season started he attended the Portland Winterhawks Main Camp as a protected list player. The Hawks eventually dropped him but he was quickly listed the the Chilliwack Bruins, also the Western Hockey League. Little did he know that he was about to have more options than playing in the WHL. He participated in the Pacific District Select Camp, which sends kids from Alaska, California, Nevada, Hawaii, Oregon, and Washington to the National Camp, where the players skate in a showcase with the best players from other districts. Usually Oregon players make it as an alternate, but Singleton was one of two Oregonians to advanced to the National Camp. Singleton took full advantage of his opportunity and finished second in points at the end of the camp. He was noticed by many scouts, college level and junior level. I was at his house a couple days he got back and there were dozens of letters from numerous teams that were interested in him. Also there was a phone call from Chilliwack during my visit. I could only imagine how great he was feeling, because I was really excited, despite the letters not being for me. Knowing that he would not be playing in Portland the next season, Singleton had many different routes he could have gone. He decided to play one more year of midgets for the highly touted Pittsburgh Hornets organization. This team was no joke. He was playing AAA hockey, with highly skilled players. Two notable teammates are Brandon Saad (NTDP and Saginaw Spirit) and Stephen Johns (NTDP, Notre Dame, and 2nd round draft pick by the Chicago Blackhawks). During his time in Pittsburgh, Singleton enjoyed a successful season and was drafted in the United States Hockey League draft by the Cedar Rapids Stampede. 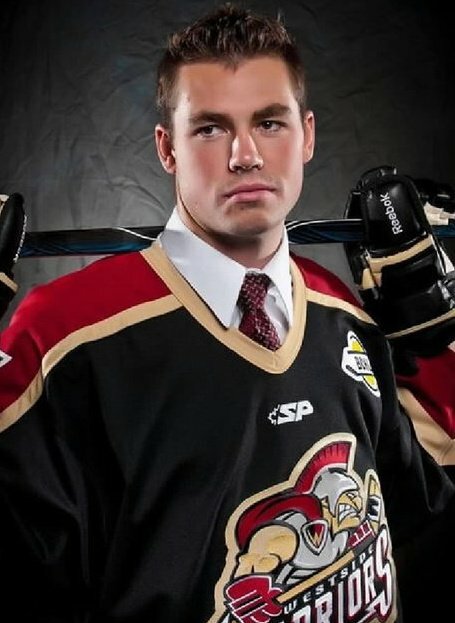 Due to changes to the staff, he was dropped from their protected list, but found a home in the British Columbia Hockey League with the Westside Warriors, which is also know to produce many division 1 hockey players. This was a big jump for Singleton, going from only one year of high level midget hockey to junior A. Beginning his third year for Westside, Singleton has become one of those high end players. During his rookie season, he was named rookie of year by his team. Pretty good when you have a couple of rookies that are already committed to play division 1 college hockey. In his second season, he was named an alternate captain halfway through the season and was awarded best all around player by his team at the end of the year. He has accomplished a lot since arriving in the BCHL. He begins his third season looking to improve on what he has already done in the league. Westside has a good shot at reaching their goals for the season. They return a lot of good players from last year. Experience is always good and can win you championship. Singleton is hoping he can help with his rocket of a shot and strong skating ability, two of his strong points. Instead of focusing on one thing, he likes to work on all areas of his game, including the strong ones. This summer I had a chance to get on the ice with him. I always knew he had a hard shot, since PeeWees he had been knocking gloves off goaltenders. But now it is unbelievably hard, I would not be surprised if he rips it through the net sometimes. Not only is it hard, but it is accurate. The best way to describe his shot is that he has a natural release. Also this summer I worked with the Winterhawks and saw their main camp. There were 13 kids out there that were going to NHL camps and I do not think I saw someone that could shoot as hard as Singleton. As a 20-year old, Singleton is looking to move on to the next level since this is his last year of eligibility for juniors. Over the last few years he has been in some serious talks with a few teams and some not so much. But the offers have been there and he has been noticed. He may be looking to commit soon, as he is in talks with a few schools right now. “As of right now though I’m talking to Merrimack, Northeastern, UNH, Bentley, University of Alaska Fairbanks,and Michigan Tech,” says Singleton. Singleton hopes to join the select few players that have made it to division 1 out of Portland. Already being offered scholarships by some schools, there is no doubt that we will be seeing him playing at the next level. He has had success at every level he has played at, so I see know reason that he will do the same at the collegiate level of play. This is huge for hockey in Oregon. Not only does it help put the state on the map, but it gives kids in the area hope and someone to look up to. Singleton’s journey through hockey shows what someone can do despite not playing youth in a hockey hotbed. Great story on Kyle, I look forward to seeing him play in October 2011 at Merrimack College! Welcome to the Augustinian family!